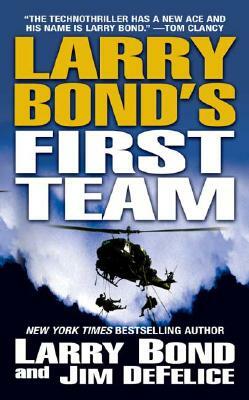 The New York Times bestselling author of the classic technothrillers Red Phoenix and Day of Wrath , Larry Bond has won praise for the gritty authenticity of his military-political adventures as well as for his matchless talent at generating edge-of-your-seat suspense. Now Bond debutes an exciting new series that rockets straight from the cutting edge of America's war on terror . . . Officially designated the Joint Services Special Demands Project, "The Team" is a unique unit created to address unconventional threats in an unconventional manner, beyond the beurocratic restraints of either the U.S. intelligence or military establishments. With an almost unlimited budget, the Team, consisting of a CIA officer, two Special Forces commandos, and one outnumbered Marine--is authorized to track vital intel and then take immediate action. A radical response to perilous times, the Team has never been more needed than this very moment: a quantity of radioactive waste, being shipped across the former Soviet Union, has gone missing. In the wrong hands, the stolen material can be converted into a "dirty bomb" capable of rendering any American city uninhabitable for centuries. With time running out, the Team must locate and neutralize the threat--unaware that their unseen enemy has already chosen a target: the island paradise of Honolulu. At the Publisher's request, this title is being sold without Digital Rights Management Software (DRM) applied.